We’ve yet to meet a person who likes hearing people chew loudly. But for some people, even the smallest noises—like breathing, throat clearing and swallowing—can be anxiety- and anger-inducing. It turns out, there’s a medical diagnosis for that, and it’s called misophonia. People with misophonia (which literally means “hatred of sound”) are affected negatively by small, everyday noises—usually ones that don’t bother most people (like chewing, yawning, breathing or throat clearing). The disorder was first recognized in 2001, so it’s still fairly new. According to James Cartreine, Ph.D, doctors don’t know too much about how common it is, but found that it often starts during adolescence. 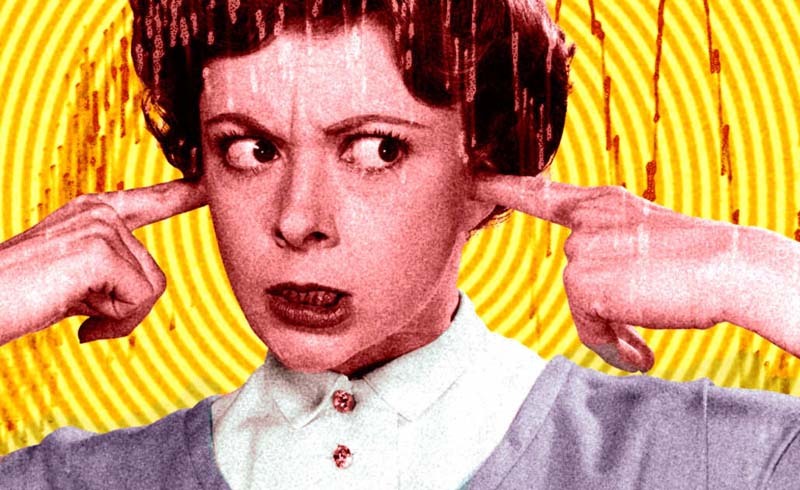 Misophonia essentially triggers a fight-or-flight response: What starts as a distracting noise becomes the cause of full-blown outrage and anxiety, to the point where the person feels like they need to remove themselves from the source of the noise itself. And it’s typically a sound that might be considered, at most, gross or annoying by everyone else. (Think: Someone chewing loudly at the dinner table.) The sounds can be so disturbing that they interfere with everyday life. Doctors aren’t sure, but promising research from Newcastle University Medical School suggests that misophonia might be caused by brain structure. Using brain scans, the researchers found that in people with misophonia, there was “heightened activity in the anterior insular cortex (AIC), an area known to play a central role in the system that determines which things we should pay attention to.” Read: Their brains were wired to a) focus on sounds most people don’t pay attention to at all, and b) have a heightened emotional response to those sounds. While there are no cures for misophonia, the Misophonia Association reports many treatments that can manage symptoms. Cognitive behavioral therapy, frequent exercise, hypnosis and auditory distraction (like white noise or headphones) have been shown to help, but it really depends on the individual. What’s the most common misconception about misophonia? Because triggering sounds can be so commonplace, it’s easy to dismiss the disorder as a sensitivity to bad manners. But people with misophonia can’t just “ignore it,” as many assume. According to Dr. Aage Moller, a neuroscientist, it’s more like being right- or left-handed than a voluntary reaction to your coworker’s gum-snapping on any given day. U.S. Daily News: What Is Misophonia?